This little mountain village had its beginning with Sam Barlow in 1845 who, rather than pay the high cost of raft transportation down the Columbia River, found a new route from The Dalles across the south side of Mt. Hood and into the Willamette Valley. Four years later a large army regiment, moving from Fort Leavenworth, Kansas to Fort Vancouver, followed Barlow's route. They were forced to abandon wagons and supplies when they were hit with heavy snows. Thereafter travelers referred to the area as "Government Camp". An attempt to change the village name to Pompeii never gained public favor, and the village is still called Government Camp. The first homesteaders, O.C. Yocum and William G. Steel, were the first to build a cabin and fulfill residency requirements. Yocum platted the area that became the core of the village. Soon a hotel and cabins begin to form the nucleus of this mountain community, serving Barlow Road travelers, mountain climbers and summer visitors. Government Camp was primarily a summer resort prior to opening of the winter road in 1926. Portland's large Scandinavian population quickly established Government Camp as a recreation area for ski jumping and later downhill skiing. Winter visitors came in large numbers to watch exciting jumping events held by the Cascade Ski Club at the Multorpor jump hill. Within a few years skiing became a participatory sport as Summit, Multorpor and Skibowl ski areas were established. During the 1930's the Civilian Conservation Corps cleared the burned-over forest of snags and built a ski shelter on Multorpor mountain. These early ski areas continue to serve thousands of skiers today. The village's fate as a winter sports base was set when the US Forest Service built Timberline Lodge in 1937. 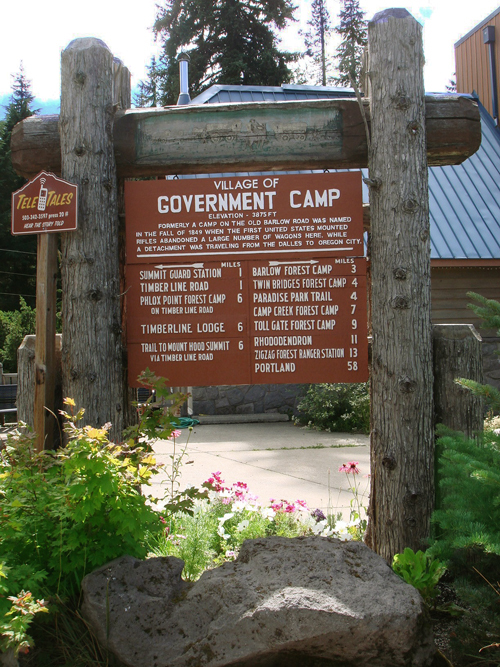 Government Camp is linked to Timberline Lodge by an all-weather road and ski trails. One hundred fifty years later, the snow that caused the US Army to camp in the area, is the reason Government Camp continues to exist.Year round skiing on Mt. Hood at Timberline Lodge draws thousands of summer skiers from around the world, in the months of June, July and August. Winter snow sports continue to attract large crowds, especially on weekends, and for night skiing under the lights of Skibowl, Timberline and Mt. Hood Meadows. We can't do it without your continued support! I would like to help sustain Mt Hood Museum and Cultural Center!